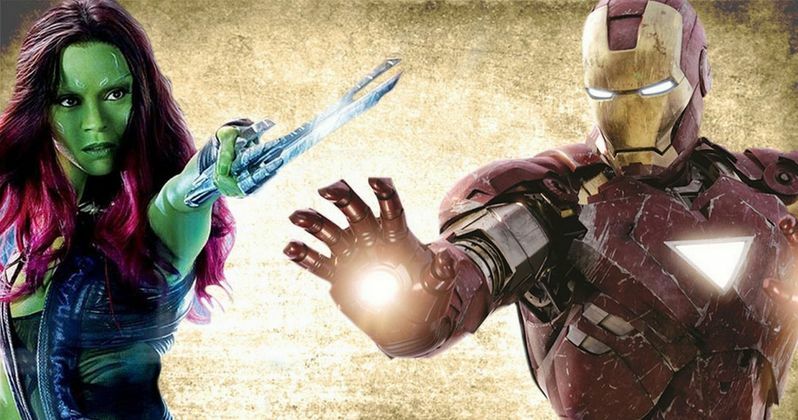 While doing press for Guardians of the Galaxy, director James Gunn and cast members Chris Pratt, Zoe Saldana, Dave Bautista, Vin Diesel, Karen Gillan teased that a crossover with the Avengers at some point. Take a look at the video below, then read on to see what they have to say. Here's what Vin Diesel had to say about a potential crossover. "I think Marvel will have a lot of options after this movie and one of those options will be integrating teams. I think there's going to be huge fans of the Guardians and there are huge fans of the Avengers and I think the discussion has already been had [at Marvel]. I think the audience may demand something like that." Director James Gunn, who is confirmed to write and direct Guardians of the Galaxy 2, revealed that a crossover has been discussed. "We talked about all sorts of possibilities [for a crossover] and I kind of know what the basic plan is. That could or could not include a couple of Avengers and a couple of Guardians meeting up, or all of the Avengers and all of the Guardians. But, we do inhabit the same universe and they're pretty big personalities that are likely to, at some point or another, run into each other. I do not think the Avengers would get on well with the Guardians. The Guardians are like a bunch of jerks, really. The Avengers, for all their problems, they're all do-gooders. And our guys are not do-gooders." Chris Pratt revealed that, while it may be difficult to follow all of the individual stories, it's possible they all may come together. "It's already difficult to follow all of the story lines. It's a delicate balance. If you go from five characters and you add another five characters, that's ten characters. That can be very difficult. That being said, Marvel knows their stuff, knows their business. Rather than taking the worlds that already exist and forcing them together, I think this opens up doors into brand new worlds. We take characters that we didn't even know existed and we see their stories." Zoe Saldana also added that she wants to see what happens when the Guardians and the Avengers join forces. "It was be awesome for the Avengers to seek help... professional help from the Guardians. [The Guardians] have all been cybernetically altered, so they're kind of super-bionic. Captain America is really good, and he's sort of the equivalent of what Drax would be, in terms of his strength. The Hulk is the only one that matches up to what we normally do, being aliens." Dave Bautista, who plays Drax the Destroyer in Guardians of the Galaxy, revealed that his character would likely clash with Mark Ruffalo's Hulk. "I'd like to see it. Just as a fan. I think it would be pretty cool, to take those characters into a new realm like that. It makes for a lot of interesting situations. Drax and Hulk would clash. There would probably be some blows thrown." Are you excited to see the Guardians of the Galaxy team up with the Avengers? Chime in with your thoughts below.